TARL wants to say a huge thank you to staff writer Michael Barnes of the Austin-American Statesman, who wrote a wonderful piece highlighting our history and collections for our local paper. Anyone interested in seeing artifacts from TARL’s collections should check out current exhibits at the LBJ Museum, the Witte Museum, and the Texas State History Museum. TARL is not open for public tours; due to the fragile and irreplaceable nature of our collections, access is restricted to credentialed researchers only. But, we do offer various events and volunteer opportunities throughout the year! Folks interested in getting involved with TARL can follow us on Facebook. Our Facebook page also has a link to sign up for our email list, which we use to send out news about events and research. Additionally, everyone interested in archeology, history, or science in general should come out to the 2017 Texas Archeology Month Fair, which will take place October 14 here at TARL. 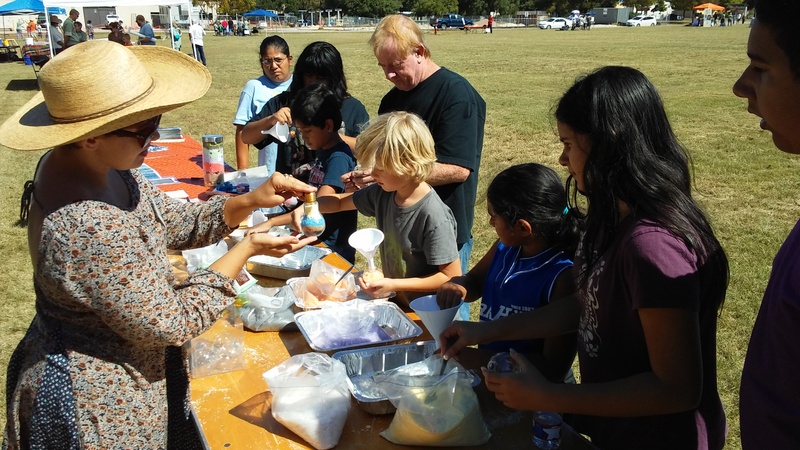 The Fair is a collaborative event between TARL, the Texas Historical Commission, and other local agencies, and will feature fun and educational activities for kids and adults. If you haven’t read the article in the Statesman, check it out! TARL is pleased to announce the publication of a new volume entitled Navajo Weavings with Ceremonial Themes: A Historical Overview of a Secular Art Form, by Rebecca M. Valette and Jean-Paul Valette, now available from Schiffer Publishing. Although this volume is focused on woven textiles, the book also features images of several of the historic Navajo sandpaintings held in the TARL collections. These beautiful, high-resolution images show the detail and craftsmanship of the incredible sandpaintings, and can help readers understand the symbolism and history of this unique art form. 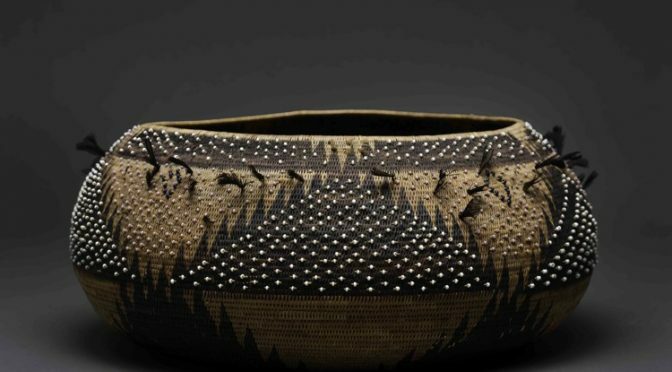 Featuring more than 500 photos and maps, this is the first comprehensive, research-based history of Navajo weavings with imagery inspired by tribal sacred practices. These Yei, Yeibichai, and sandpainting textiles have been the most sought after by collectors and the least studied by scholars. In spite of their iconography, they never served a ceremonial function. 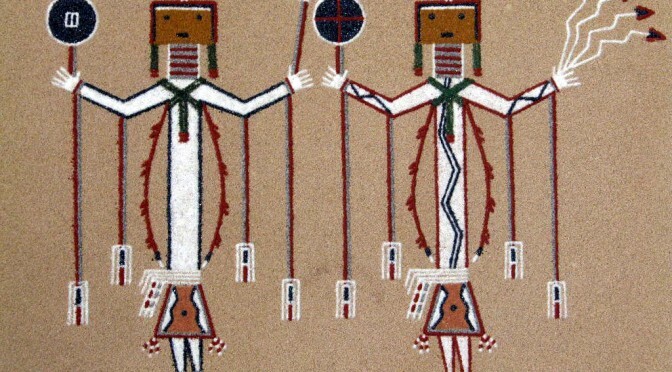 They were created by Navajo women at the instigation of traders, for sale to wealthy collectors willing to pay premium prices for their perceived spiritual symbolism. This book describes the historical and artistic development of the genre from its controversial emergence around 1900, to the 1920-1940 period of intense creativity, and concluding with the contemporary search for innovative patterns. Never-before-published weavings, detailed annotations, and an extensive bibliography make this an invaluable reference for scholars and collectors, and a fascinating exploration for all who are interested in the Southwest and its native cultures. Learn more or purchase this volume. 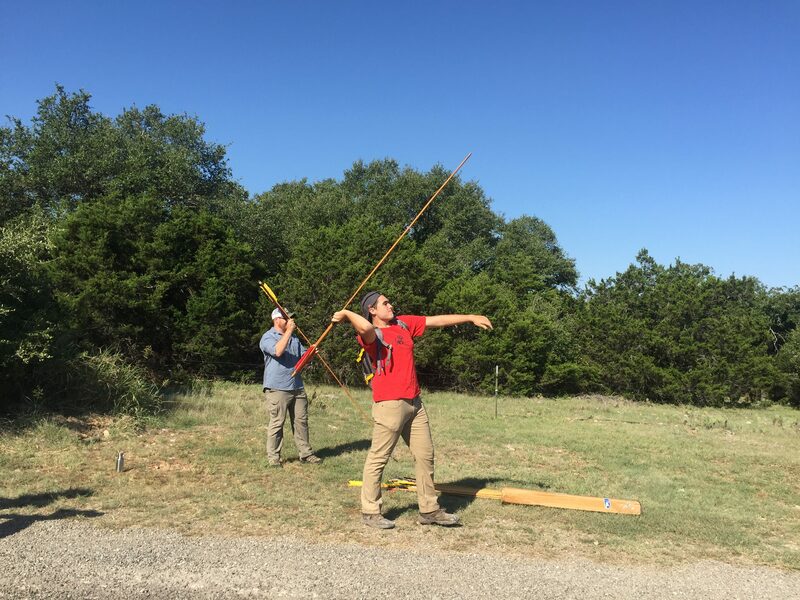 As part of our efforts to engage students and community members in Texas archeology, TARL tries to offer learning opportunities for our interns and volunteers outside of the lab. 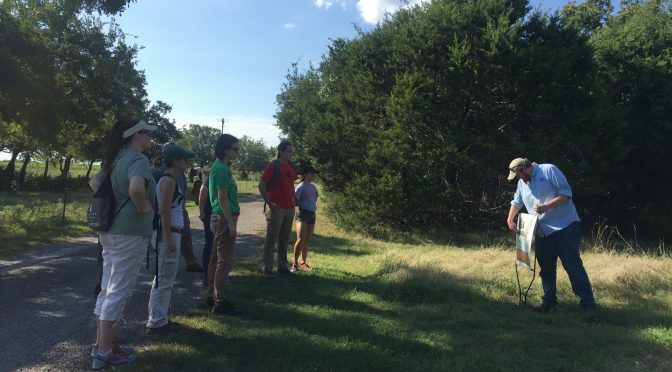 This week, we brought a great group of students and volunteers to the Gault site in southern Bell County. The Gault site (41BL323) first caught the attention of archeologists over 100 years ago. Although some parts of the site were damaged by looting and pay-to-dig operations throughout the 20th century, more recent scientific excavations have uncovered massive, intact Clovis deposits dating as far back as 13,500 BCE and even evidence for older-than-Clovis habitation at the site. 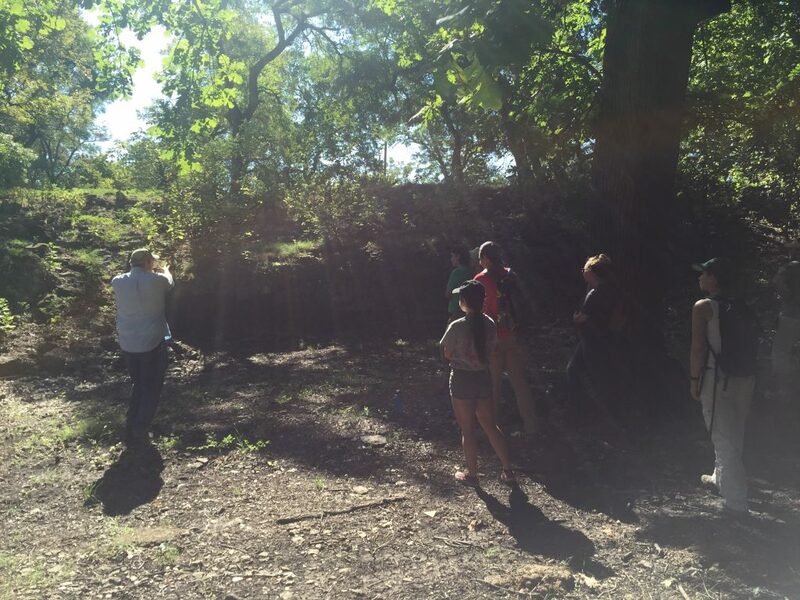 No new excavations are going on at Gault right now–the project staff have lots of data to write up and publish before opening up new excavations–but our excellent tour guide, Dr. Tom Williams, was able to show us previous excavation areas and teach us a ton about the site. Dr. Williams explains how the limestone outcrop functioned as a lithic raw material procurement zone, and points out some petroglyphs that likely date to the historic period. As much as we love looking at artifacts in the lab, it’s important to get out and see the sites themselves, so that we can gain a deeper understanding of the role of the landscape in prehistoric lifeways. At the Gault site, our group was able to see how a location like this one is an ideal spot for habitation: it’s close to water and on the border of different ecological zones, meaning that many different types of resources are available nearby. 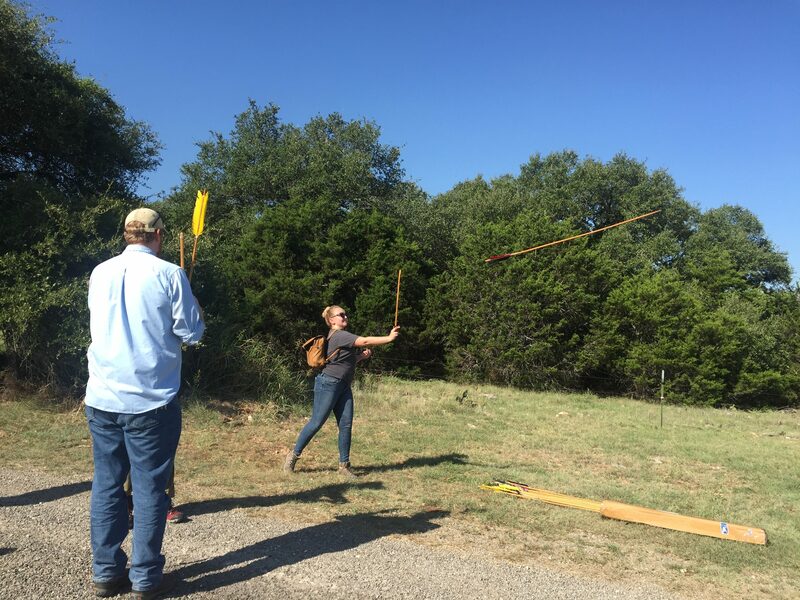 We also got to try our hand at throwing darts using an atlatl, just as Paleoindian hunters may have done! Rachel makes her dart fly! Jeff and Sheldon are ready to go mammoth-hunting. Another fascinating part of our visit was learning about the various hypotheses for the early peopling of the Americas, and how research at Gault is contributing to our understanding of the earliest inhabitants of our continent. Increasingly, evidence is suggesting that the people all over North America and beyond who used Clovis tool technology were not the first immigrants to these areas. We look forward to seeing all the exciting research coming out of the Gault site! Thank you to Dr. Tom Williams of the Gault School of Archeological Research for sharing all your time, effort, and expertise–you made this a trip to remember! Read more about Gault on Texas Beyond History. Visit the Gault School’s website to learn more and schedule your own visit! 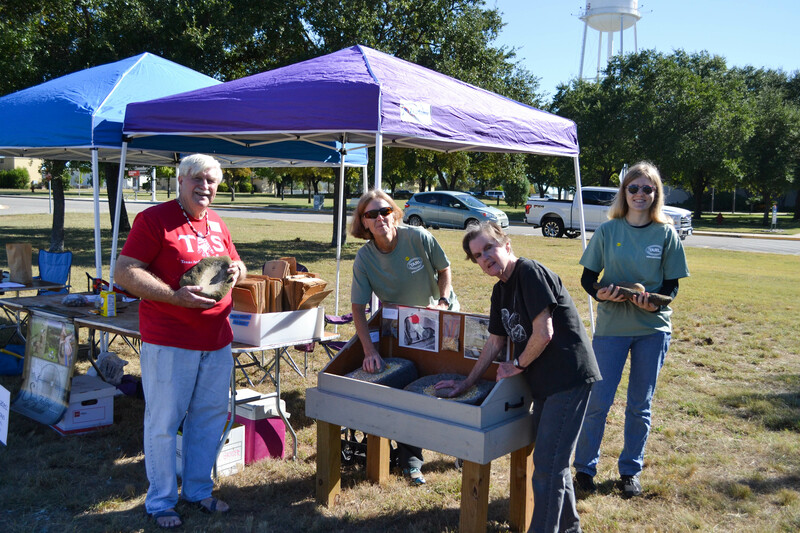 It’s that time again… the Texas Archeology Month Fair is coming up! 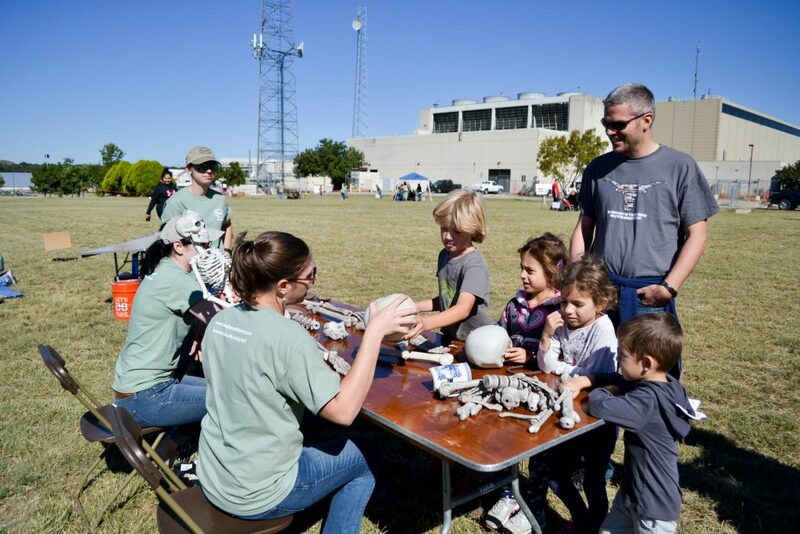 TARL is teaming up with the Texas Historical Commission and other local agencies to provide a fun day of hands-on educational activities, presentations, and exhibits for kids, older students, and the general public. 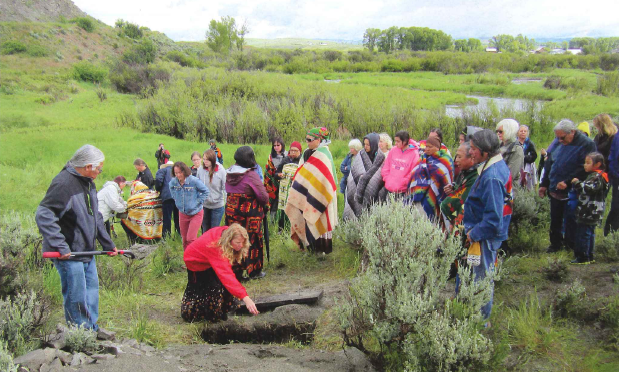 Our goal is to increase public awareness of the fact that archaeology is happening around us all the time, and to promote archaeology as an important part of environmental conservation and scientific research. 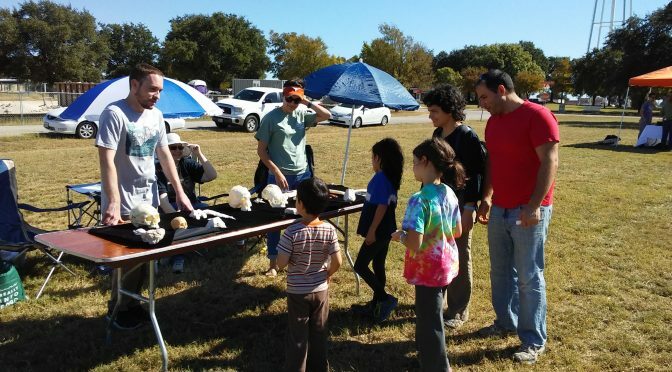 We are looking for professional and avocational archaeologists and general volunteers to host activity tables and displays, assist other presenters, and help with setting up the Fair. We hope to have upwards of 20 presenter booths and bring in more than 200 visitors. The Fair is free and open to everyone. Please contact TARL by commenting below or via email at FriendsofTARL@utexas.edu to volunteer. We hope you’ll join us! Here are some great photos from last year’s event. Thanks again to everyone who helped out in 2016!